This is the eBook of the printed book and may not include any media, website access codes, or print supplements that may come packaged with the bound book. 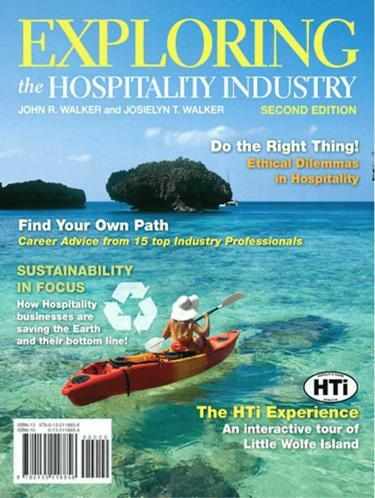 Exploring the Hospitality Industry, 2e offers broad coverage of the hospitality industry in an easy-to-read, conversational style. Written by best-selling author John Walker, this book is less theoretical and more industry-relevant than most–emphasizing the people, companies, and positions that make up the hospitality industry today. Moving beyond just restaurants and hotels, it includes new growth areas such as event management, meeting planning, cruising, theme parks, attractions and entertainment. With a new focus on sustainability, this edition features case studies, practitioners and corporations that engage and involve readers as they explore the trends in this ever-growing field.